The glossy-finished new fifth-gen iPod nano builds upon last year's tall and slim form factor by adding video recording, FM radio with iPod tagging and Live Pause, VoiceOver navigation, a built-in Nike+ step counter, and a slightly larger and improved 2.2" display, all packed into the same thin aluminum tube. The tall orientation of the revised nano might be the ideal design for delivering its biggest new feature, but it's a bit puzzling that Apple put the new video camera at the base of the unit. Unlike the iPhone, which places its camera at the top corner of its back, the new nano fits its camera at the bottom, opposite the click wheel used to start and stop the recording. As a result, while it's easy to get your hand in the way of an iPhone shot, it's hard to position the nano for recording without having your fingers in the shot. The most natural way to hold the nano completely obscures the camera lens with your hand. Fortunately, there are two approaches that work. The first is to hold the device with the tips of your fingers (below left) rather than cradling it in your hand. This allows for precise aiming with one hand in both the landscape and portrait orientations. 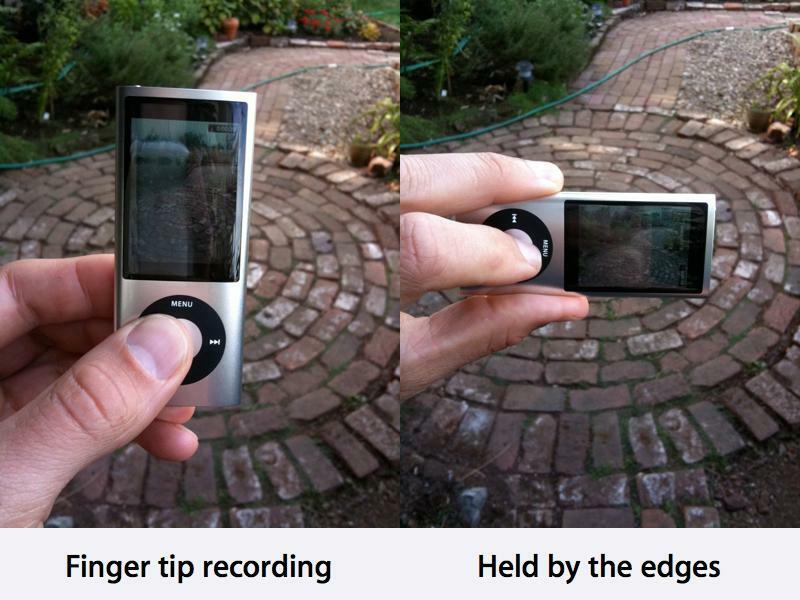 The alternative is to hold the device by its edges while recording (below right), something that might require both hands if you lack dexterity. The only discernible upside to putting the camera in such a location is that it signals when it is being used for recording. You don't have to wonder if somebody is secretly filming you with their iPod nano in the gym unless they're holding it in contorted, awkward way that indicates they probably are. Apart from that, there's no other explanation. As a video camera, the new nano is remarkably good. It's also extremely simple to operate, takes decent quality video at VGA resolution (640x480) at a fluid 30 frames per second rate. The total bit rate of its movies is around 2,500 to 3,000, making the output files portable and compact, and well-suited for online use. Video shot by the nano compares favorably with video shot with the iPhone 3GS. An example taken with the nano's camera in landscape mode actually looks better than video taken simultaneously with the iPhone 3GS in portrait mode. Both devices create video output files in VGA (0.3 megapixel) resolution, although the nano has a wider angle, fixed focus lens on a camera mechanism that likely has a much lower native resolution than the 3.0 megapixel camera in the iPhone 3GS. In both cases, the camera's raw video is compressed in software as it is recorded. 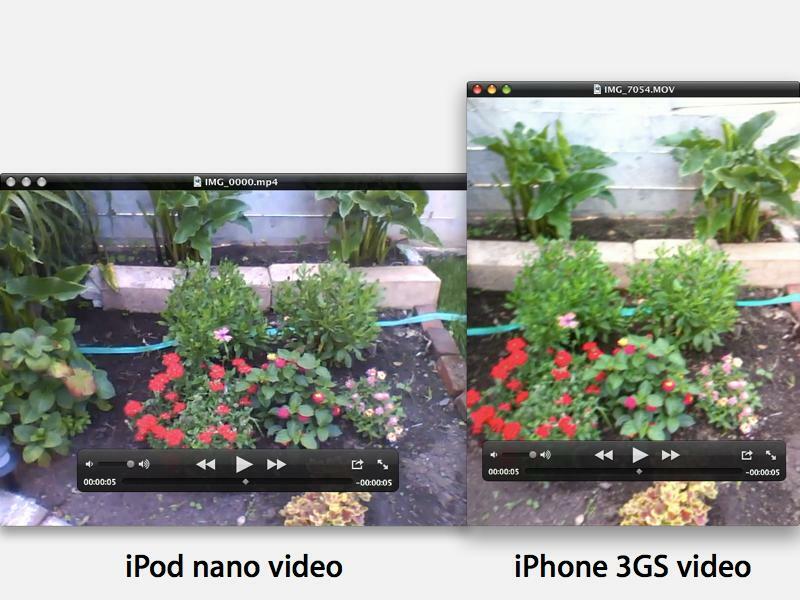 Even so, our iPhone 3GS video consumed a higher bit rate (3,700 vs 2,800 kbit/sec on the nano capture) yet delivered muddier video, perhaps indicating that the iPhone can dramatically improve its video capture via optimized software. Uploaded to YouTube, the video is compressed even further, but still good (below). Also important in creating usable video is the nano's integrated mic, which captures pretty good quality audio. Few things are as disappointing as capturing video with badly garbled audio or blank silence. The nano picks up inside voices quite clearly using the mic next to the camera lens. Video playback on the nano is also readily audible using its tiny internal speaker. The audio recording quality is even better when you record video using the mic integrated into a pair of iPhone-style headphones. Note that the nano only ships with standard headphones lacking an integrated mic, however. Even using the nano's built-in mic, audio is decent and very usable for the casual applications one can expect of it. You probably won't want to use the iPod nano's tiny speaker as a boom box for listening to music, as it isn't capable of producing very high fidelity music, but it can serve a functional way to share videos with friends without using headphones. The camera doesn't take photos, although you can of course snap a still video shot and export a frame of the video as a picture. With the camera held still, you can make out pretty good details, although any motion renders still shots quite blurred. The choice to make the nano's camera video-only wasn't just arbitrary, but based on the fact that it uses a simpler camera mechanism to fit its thin body. The fancy autofocus camera in the iPhone 3GS is twice as thick as the nano's. 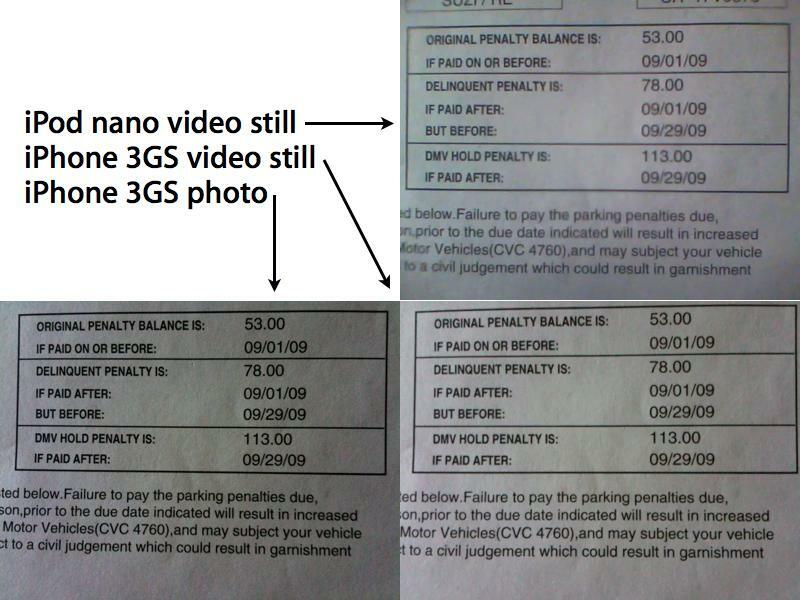 Below is a picture of a parking ticket that's been laying around, snapped with the nano's video camera and the iPhone 3GS in both still and movie modes. They're all easily readable, but the iPhone photo visibly sharper, while the nano's video still suffers from noisy smearing. While the new nano makes a pretty decent video camera for casual captures of your friends, the type of photographs it could take, given the tiny amount of room available for the camera, would not make it competitive with even the low end of standalone toy cameras or cell phone cams. On the other hand, its video features make it suitable for replacing a separate digital video recorder unit on outings or at parties. Like any tiny CCD camera, it takes the best shots in good lighting. Inside in dim lighting, shots get noisy quick and motion blur is a lot more evident. The video-capable nano isn't going to put Flip out of business, but it will dramatically expand the number of recording eyes out there in the hands of millions of iPod users. Given that the nano's video recording feature doesn't cost any premium over the previous generation, Apple is effectively dumping millions of free video recorders into the market, something that will impact the emerging market for standalone video recorders. On page 2 of 3: Special effects; Hardware features: Nike+ and pedometer; Hardware features: FM radio; and Hardware features: VoiceOver.